The following is a letter being sent to Tucson’s mayor and city council members in opposition to the proposed 75 percent budget cut for the Tucson Pima Arts Council. My name is Daniel Buckley. I have lived in Tucson since 1971. Since the early 1980s I have been an artist in various genres, the president of a downtown cooperative arts gallery for five years in the 1980s, and for 22 years, an arts writer for the former Tucson Citizen. I write to you today in support of the Tucson Pima Arts Council. On March 25 of this year I received the Artist of the Year recognition at the Governor’s Arts Awards in Mesa. That would never have happened without the invaluable help of the current incarnation of TPAC. I was not allowed to actively engage in my pursuits as an artist in the community during my time at the paper as it was deemed a conflict of interest. When the Citizen’s print operation shut down in 2009, I became an active artist again. The arts world had changed greatly in my two decades of forced dormancy, and honestly I was ill equipped to get off the ground. Through several extended workshops sponsored by TPAC I learned how to create and update my own website, how to effectively use social media, and how to engage the community in my projects in a way that benefits everyone. In 2009, with help from the late Ralph Gonzalez and Julie Gallego, I began the Cine Plaza at the Fox documentary series to explore the history and culture of Tucson’s Mexican American community. So far five films have been created in that series, documenting the historic El Casino ballroom, Tucson’s Urban Renewal period, the Cine Plaza theatre and various barrios in the community. Currently I am in production on a sixth, called “the Mariachi Miracle.” It documents youth mariachi and folklorico programs in our community and their impact on the social, political, educational and economic vitality of Tucson. Both the current film and the El Casino film were partially funded by TPAC. But all of them were aided by what TPAC taught me about succeeding in the business of art. When I was at the Governor’s Arts Awards one of the speakers said that research shows that every dollar in arts funding returns $1.50 to the community. What other programs do we have with that kind of return on the investment? Let’s talk about the arts in Tucson. Artists are the original downtown developers. In the 1980s when I was part of a cooperative artist gallery there, well over 90 percent of Congress Street was shuttered. We brought people downtown and made it a hip destination, first with the Club Congress and then up and down the street. Artists remain the main draw that brings Tucsonans downtown from other parts of the city. Tucson owes downtown’s success to its arts community. Part of what draws outsiders to Tucson, be they tourists, new residents or potential industry, is its strength as an arts destination. Public art, a vibrant music scene that includes rock, folk, jazz, mariachis, and waila musicians, a strong and deeply rooted symphony, opera, theatre and chamber music scene, our poetry center, the Center for Creative Photography, visual arts galleries of every stripe, open artist studio tours and many more. These are the very calling cards Tucson lays out when trying to attract industry and good paying jobs to our community. Those things do not happen without TPAC’s help. The arts also have a huge impact in education. Music and dance programs stimulate the type of brain development that leads to better understanding of mathematical and scientific concepts. All of the arts aid in reading and self expression. They help us reimagine our world. The leadership skills, and the 21st century workplace skills we hear so much about directly relate to arts education. And while TPAC doesn’t directly support our schools, it does give arts educators outside opportunities that help them develop their skills, renew their passions and bring that excitement back to the classroom. TPAC community programs have indirectly resulted in gang abatement and reduction in graffiti because when young people are engaged in the making of their own art, as they have been in many TPAC sponsored projects, they see themselves and their possibilities in an entirely different way. The benefits to our city of what TPAC does are everywhere you look – in our multicultural communities, and our schools. In real downtown development, in tourism and industrial growth. For artists, TPAC is critical for making us successful in the marketplace. TPAC’s newsletter makes us aware of grant and job opportunities around town and around the nation. 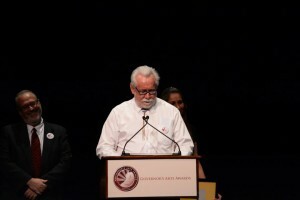 Its LUMIES recognize artists and arts people who make a true difference in Tucson. Its small gallery gives visual artists a place to show and validation of their work. And its grants help artists transform our community in positive ways. I have been in contact with TPAC since it started, and often wrote about the organization in my time with the Citizen. There were good times and bad. Never in its history has such a team been put together as now. As a result our community is better equipped to move forward, and our arts efforts turn up on the national stage far more often as a result of this organization than ever has happened in the past. The spotlight is on Tucson today in large part because of what TPAC does. The proposed 75 percent cut in funding would be devastating, not just to TPAC but to all of Tucson. It would significantly reduce TPAC’s ability to leverage funds with corporate sponsors as it has so successfully in recent years. It would hurt downtown development and the attraction of industry. It would blunt the development of a skilled workforce in the community. And it would hurt artists who contribute so much to our city, often on poverty level budgets. It takes years to assemble a team that creates the opportunities that TPAC has for our city. It would take the stroke of a pen from mayor and council to throw it all away. And it would take a decade or more to reassemble, if it ever could be done again. The proposed cuts are an insult to Tucson’s creative community – a vital group that cuts across every ethnic, cultural and economic divide. We built, and continue to build, the modern multicultural city now so often listed as a choice destination to vacation or live. I encourage you to reject the proposed cuts and invest in Tucson’s future at a funding level of $1 per capita for TPAC. ~ by Daniel Buckley on April 8, 2014. Beautifully said, Dan. Thank you for your advocacy of the arts in Tucson and for your many years of leadership and support of the artists around you!